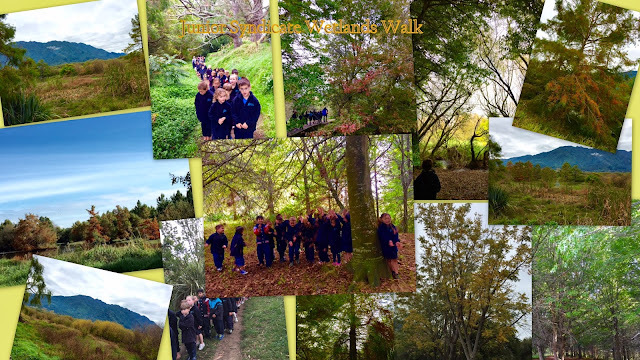 Yesterday Rooms 5,6,7 and 8 were lucky enough to go on a walk around the wetlands. This was a part of our unit that we are currently working on, and something that the syndicate tries to do each year. The students had a great time looking at all of the different colours on the trees and plants , and were lucky enough to even spot some bird life along the way. Room 5 is currently working on an Autumn unit in class. We are looking at which trees loose their leaves and the lovely colours that we see at this time of year. Here are some of the photos taken on our walk yesterday. The students loved getting out and about in our area and for some it was a first time. We are very lucky to have such a great resource on our back door step.